Welcome to the beginning of a new week. Thank you so much to everyone who took the time to enter our 'The Sound of Music' challenge. The Design Team loved looking at all the fantastic music inspired projects in order to pick our winners. This time we've chosen Cathy Frailey as our overall winner. 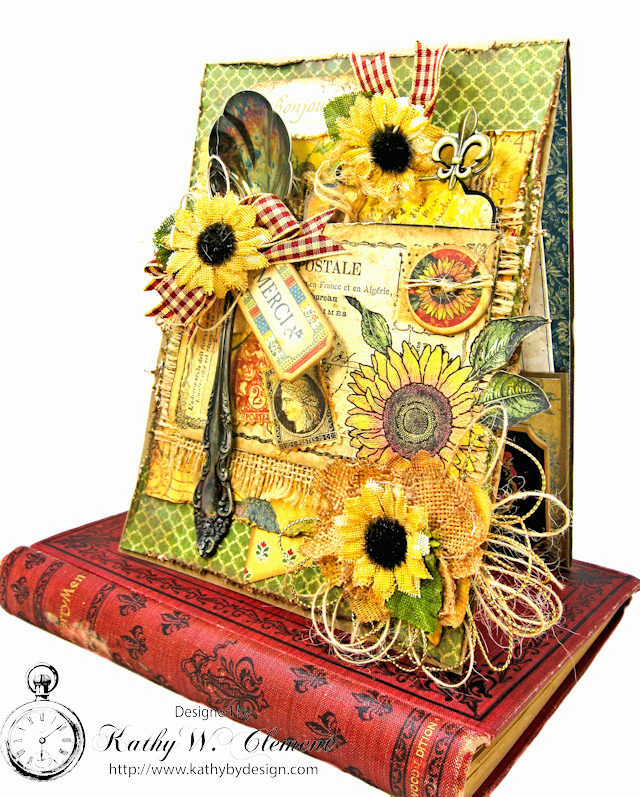 We thought this was such a beautiful and imaginative vintage style project. Congratulations Cathy on being our favourite for the 'The Sound of Music' challenge and winning the opportunity to be a Guest Designer here at Frilly and Funkie for a future challenge. And now for the three winners of our Frilly and Funkie Top 3 Badges for this challenge; the choices, in numerical order, are... #11 Jess, #12 Jenny, and #14 Jannet. Please email Linda at thefunkiejunkie@gmail.com for the codes for the Top 3 badges so that you can display them proudly on your blog. And finally Random.org has chosen a lucky winner for the $25 gift certificate to The Funkie Junkie Boutique. Our congratulations this time go to #16 Judy! A big thanks from the Frilly and Funkie team to everyone who took part in this challenge and congratulations again to our winners. Once again, please email Linda at thefunkiejunkie@gmail.com for the codes for the winner's badge and to give us your email address for the Guest Designer details (Cathy), for the Top 3 badges (Jess , Jenny and Jannet) and for the gift certificate details (Judy). Our current challenge, 'Something Old' runs through Tuesday, June 6th. And the Funkie side of the team will be here on Wednesday with some more inspiration for you. We hope to see you entering so that you too can be in with a chance to win. 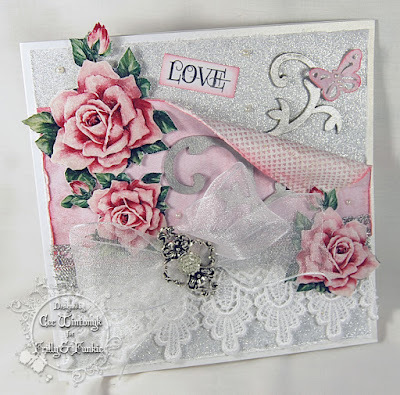 It is Cec here and today I am presenting the Friday Focus and this time it is about lace and ribbon. This is our opportunity to share with you ideas, tips and techniques for using a specific product or range currently available at The Funkie Junkie Boutique. Those products will have an extra 15% discount added through June 8th! This time I am going to show you a few projects I have made that may not have lots of techniques but should provide you with some inspiration. 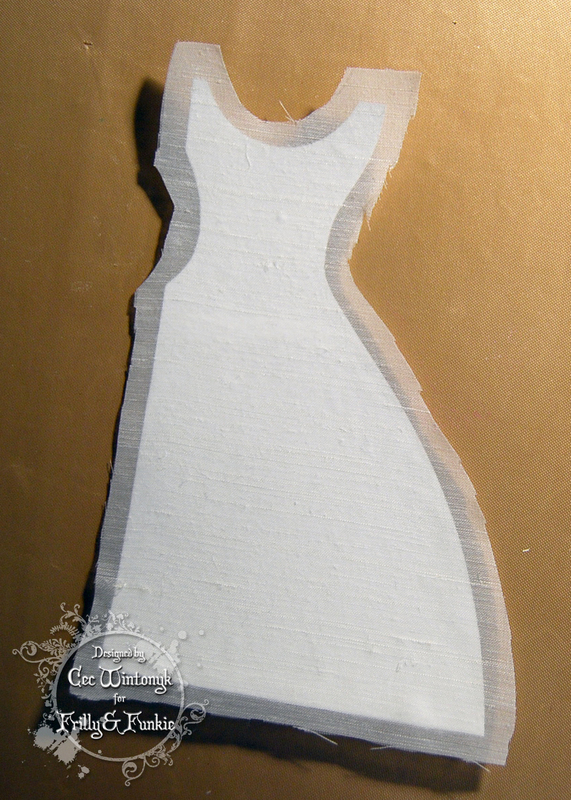 First up I have made a simple card with a wedding gown. 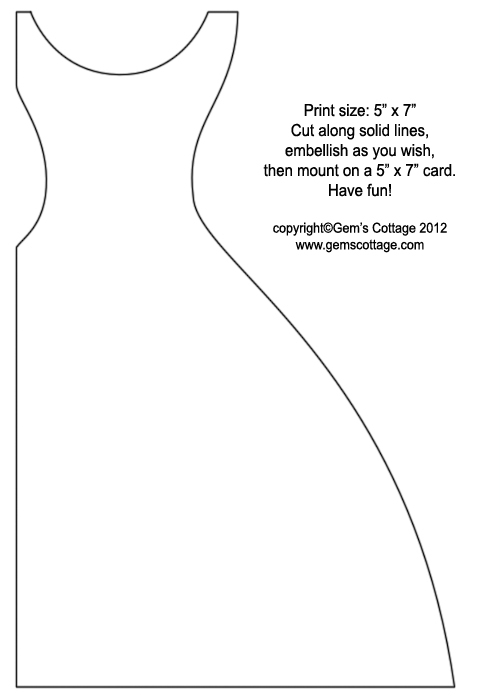 I found this freebie template online at Gem's Cottage Blog, brought it into Word, printed it on some card stock and cut it out. 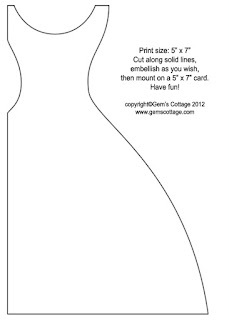 Tip: To make it easier to cut out, decide which side you want your gown to be on the card and then flip it horizontally in Word before you print it so you have a clear line for cutting that won't show when you flip it back over on your card. The next step was to cover the gown cutout with a wet adhesive using your fingers or a credit card to get right to the edges and then cover it with some fabric. I used a scrap of old drapery sheers that has a bit of a slub in it. This fabric is never going to run out there is so much of it. I turned the edges of the fabric and adhered it to the back of the card stock, making sure to clip every 1/4" on the curves. I made a skirt overlay from some tulle and added that onto some double-sided tape at the waist, gathering as I went. 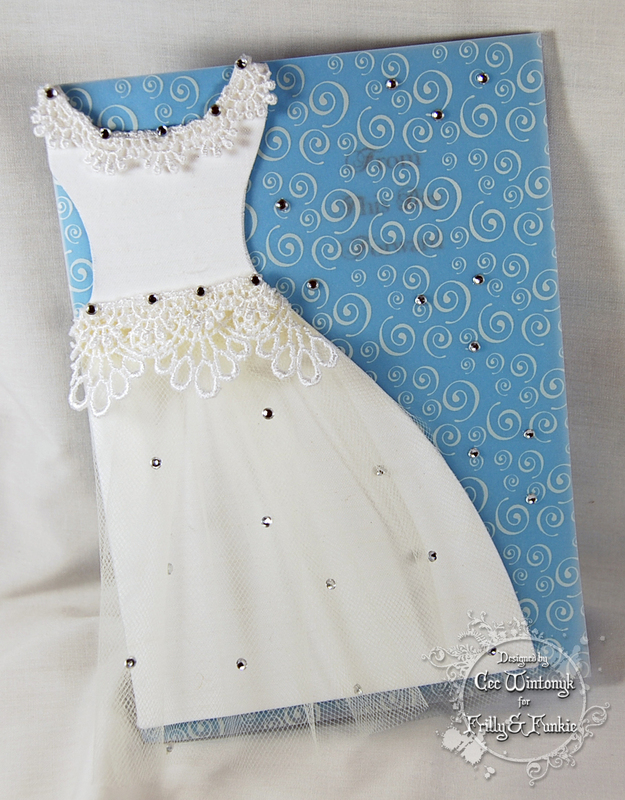 Then I set about to decorate my dress with bits of lace and sparkly gems. 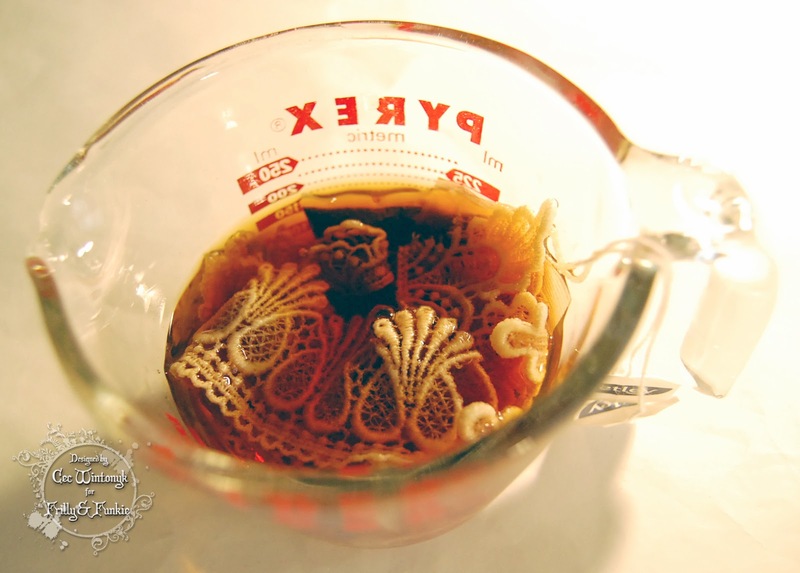 Tip: Don't throw out even the smallest pieces of lace because they can be so useful. I printed a piece of blue card stock with a sentiment and then decided the plain blue card didn't have enough life for my lovely dress. I found the printed vellum in my stash and thought it would make a nice wrap for the card but I wasn't sure it would go through my printer so I just added it to the outside before I added the gown. I wish I had a second piece because now the sentiment is rather lost but you get the idea. I only glued it along the spine of the card so it can be moved to view the sentiment. Next I made a shabby card. There are no process photos here but I will describe how I made it. I started with some shimmery white card stock as the blank and then added a panel of silver glitter paper that was in my stash. I added a panel of paper from the Maja Designs pad called Coffee in the Arbor that was distressed and then inked on the edges with Worn Lipstick Distress Ink. I curled one side over to reveal that pattern on the back. Tip: To ensure that this stays put use a Heavy Gel Medium to adhere it - double sided tape is not strong enough. A strip of lace topped with some silver crochet ribbon was added next. I fussy cut some roses that I printed and added them with some dimensional foam tape. I cut a wooden flourish in half, painted it silver and added that next. I made a bow from some sheer white ribbon and topped it with a filigree metal piece. 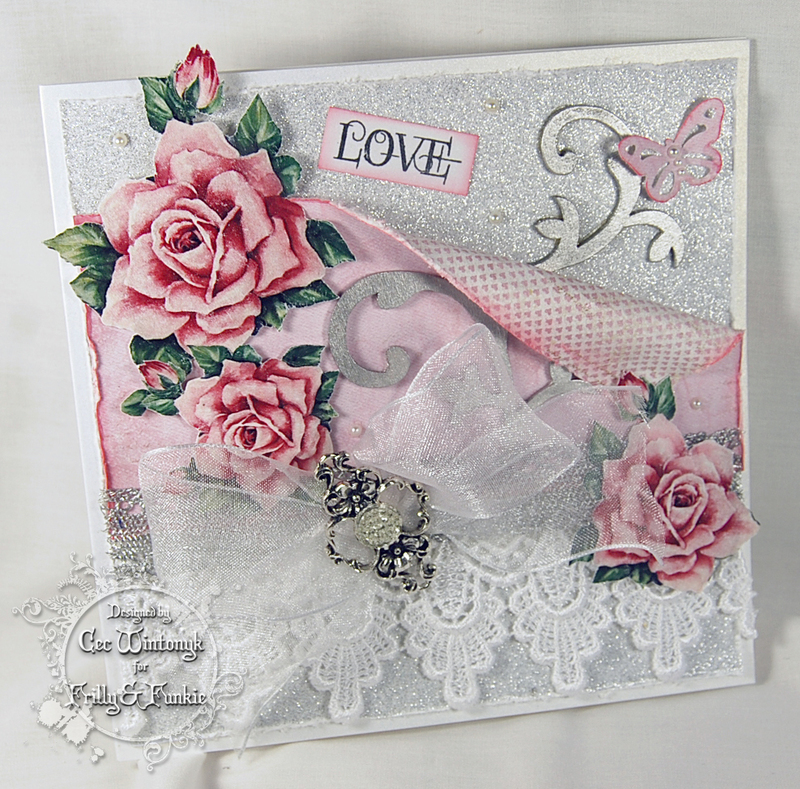 A stamped sentiment edges with Worn Lipstick DI and a punched butterfly were added along with a few pearls. 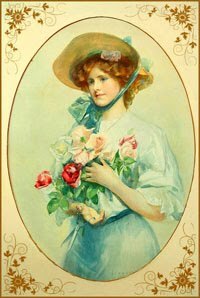 Lace and ribbons make great additions to feminine cards, cards for Valentine's Day or even for a wedding. Finally I made a little Christmas wall hanging chock full of lace with some added ribbon. I started by cutting a piece of mat board 5" x 7" and drilling two holes in the top. Tip: If you make this a little smaller, it would make a great tree Ornament. Since I had decided I was going with a very vintage look with a neutral palette I dyed a bunch of pieces of lace in some tea. Tip: Test a small piece of lace to determine how much colour you want to give it. If you want it darker you can always reheat your tea in the microwave and start again. I used two tea bags in boiled water and left it to steep for about 5 minutes but it was too dark for my liking even after I ran it through some clear water so I added a small amount of bleach to water and left the lace in for a couple minutes. Once I had a colour I liked, I painted the mat board with some Folk Art Country Twill acrylic paint, which was the closest in colour to my dyed lace. The next step was to layer dyed lace, white lace and burlap ribbon that I cut in half to cover the mat board. I also added a couple strips of some fuzzy fibers from my stash. Tip: Start at the bottom and work your way up, overlapping as you go much like the shingles on a roof. I printed a freebie image from Linda, The Funkie Junkie, distressed the edges and inked them with some Vintage Photo Distress Ink before I adhered them with dimensional foam strips. Next I made a big bow and added that followed by a hanger made of macrame cord (your eyes did not deceive you - I said macrame). Sometimes it pays to be a craft hoarder - LOL. 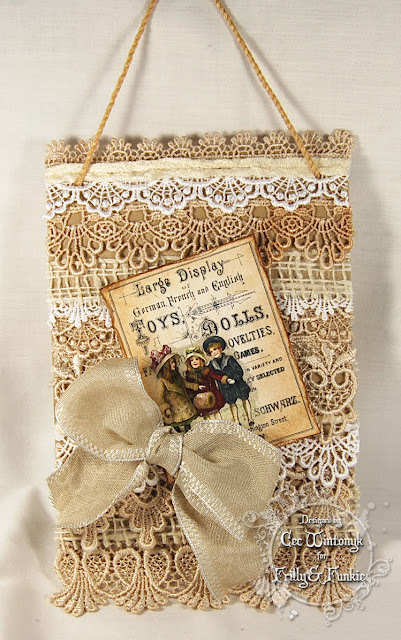 I hope I have inspired you to add lace and ribbon to your projects. 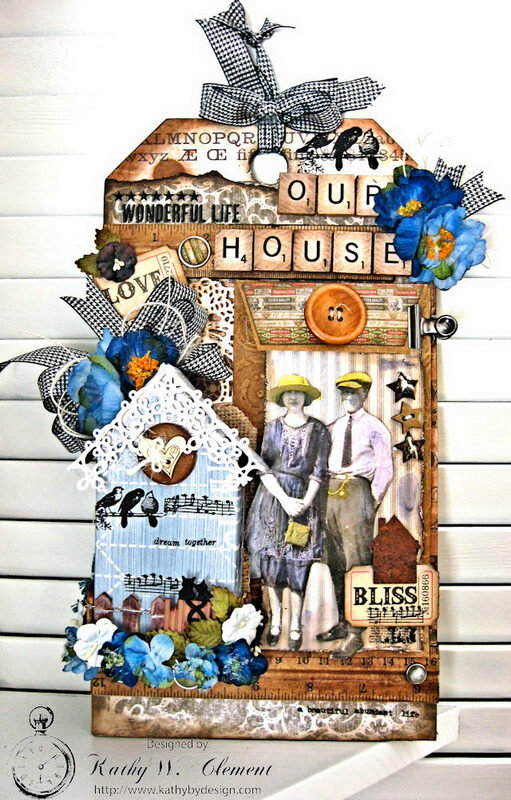 It is time welcome our Guest Designer for the 'Something Old' challenge. 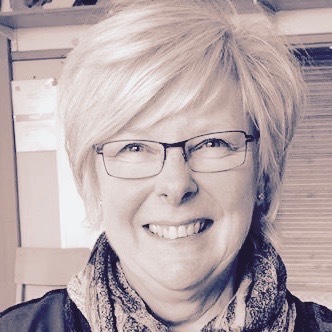 Please say hello to Jennie Atkinson, a familiar face who often enters her wonderful creations in our challenges. 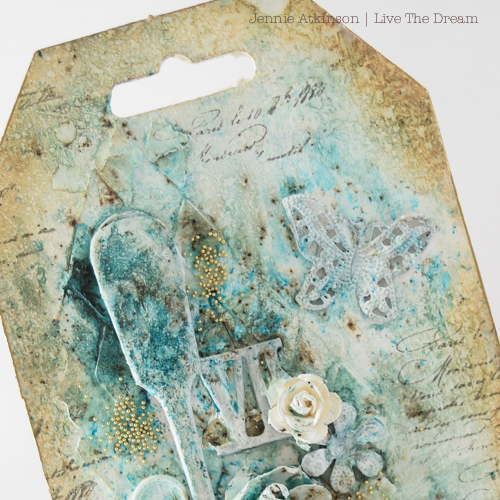 Jennie's blog is Live the Dream and she won this Guest Designer spot by being the Design Team's favourite from the 'April Showers' challenge. 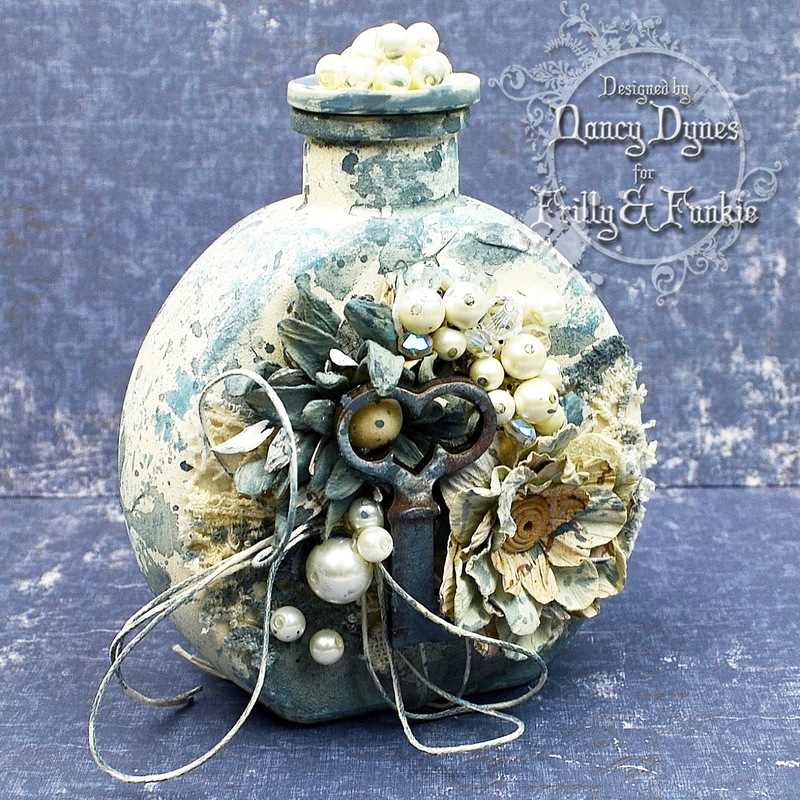 It is always a treat to be here as a guest designer with Frilly and Funkie - one of my favourite places! Over the years I have learnt so much from the DT - their projects and in particular the step by steps. This has been really important for me living on a remote Scottish Island in that I don’t get to see products or other crafters very often! Living in Shetland however can be very exciting - not least the weather, but the scenery and wildlife are stunning too. I spend at least some time every day in my craft room but also enjoy textiles (spinning wool and knitting). My crafting style is vintage shabby and more on the soft side of the colour spectrum but for this challenge I thought I would be a bit bolder, especially as it was my very colourful April Showers project which won the April challenge! Thank you to Linda and everyone here at Frilly and Funkie for inviting me to share a project for this great challenge. My “something old” is this little spoon I found in a charity shop and which has caught my attention a few times for a project, but it finally made it! The tag is actually an old button card and it took the gesso and texture paste really well. This allowed me to add a number of different types of embellishments which were then “neutralised” with gesso. Once dry I had great fun adding PaperArtsy Infusions (A Bit Jaded) with lots of water, along with some text stamping in the spaces. 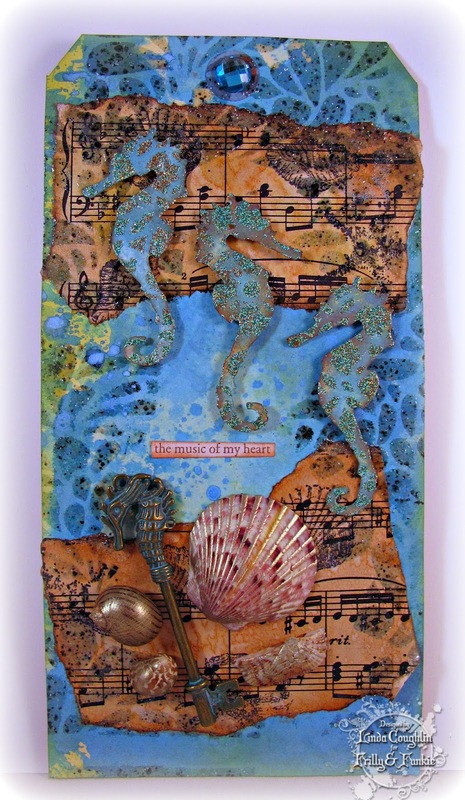 I just love the watery nature of the Infusions and the way they “puddle” in the texture and around the embellishments. 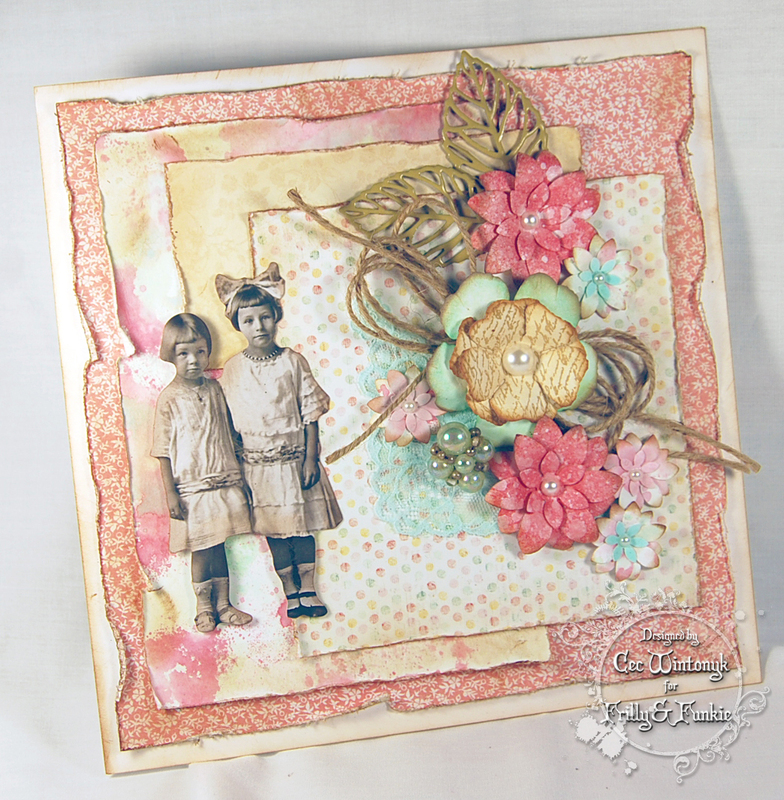 I find the Infusions work really well with the new Distress Oxides, so Vintage Photo was blended around the edges and spritzed very carefully with water in order not to lose the effect of the Infusions. Jennie has included a few step by steps in her blog post, so do hop on over if you would like to see more. Once you have checked her project out come on back and show us your 'Something Old' creation. The challenge can be found here and is open until 11:55 pm on June 6th. Hello, Friends! It's Kathy Clement here with another Saturday Step x Step tutorial. In case you haven't heard the news, Graphic 45 is releasing French Country as a Deluxe Collector's Edition. Ooh la la! 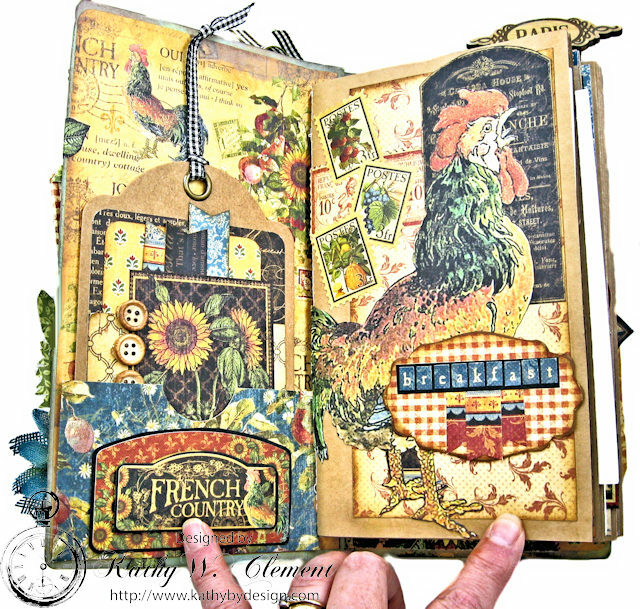 To celebrate, I've created a really fun Bon Appetit recipe album using Eileen Hull's HeARTfelt Journal die. Go grab a snack and a cuppa and we'll get started. My thought process behind this album was to create a sort of heritage recipe album. But as I was working on it and thinking about ways it could be used, this thought came to me. So many people take photos of their food plates when dining either at home or out in a restaurant. Wouldn't this be a fun way to catalog your favorite fine dining locations? And, it would make a great gift for the new bride. I made similar albums for each of my children when they moved into their first homes so that they would have all their favorite recipes from home. Any way that you decide to use it, prepare to have fun! I've prepared a Snapguide Tutorial to guide you through the process of assembling the album, preparing the signatures and decorating the album cover. I hope you enjoy! I find it very hard to capture a project like this in still photos. To remedy that, I've prepared a 15 minute YouTube Video tour of the album. 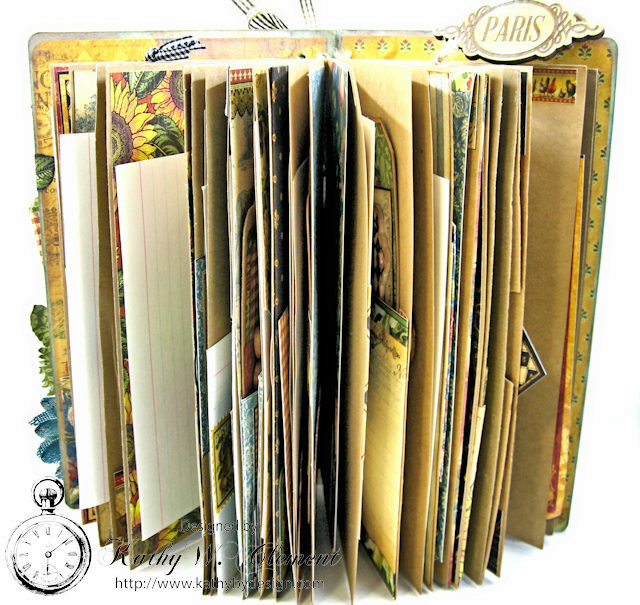 You'll find lots of ideas for way to add interactive elements like pockets, tags, flip pages, and fold outs to your album. I also go over the basics of putting the album together. I hope you enjoy! I hope I've shared some tips and tricks that you can use in your own crafty adventures. 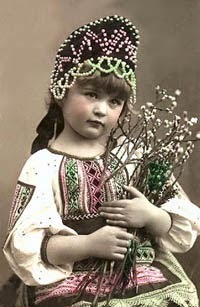 Enjoy your weekend, break out your paper pretties and get your craft on! Welcome to the beginning of a new week. Thank you so much to everyone who took the time to enter our 'Put on Your Inking Cap' challenge. The Design Team enjoyed looking at all the incredible projects to pick our winners - the standard was so high and it was another difficult decision! This time we've chosen Autumn as our overall winner. What an amazing way to alter a house shrine without using any patterned paper! Congratulations Autumn on being our favourite for the 'Put on Your Inking Cap' challenge and winning the opportunity to be a Guest Designer here at Frilly and Funkie for a future challenge. And now for the three winners of our Frilly and Funkie Top 3 Badges for this challenge; the choices, in numerical order, are... #2 Lula, #11 Jane, and #21 Sara!!! Please email Linda at thefunkiejunkie@gmail.com for the codes for the Top 3 badges so that you can display them proudly on your blog. And finally Random.org has chosen a lucky winner for the $25 gift certificate to The Funkie Junkie Boutique. Our congratulations this time go to #30 Lucy! A big thanks from the Frilly and Funkie team to everyone who took part in this challenge and congratulations again to our winners. Once again, please email Linda at thefunkiejunkie@gmail.com for the codes for the winner's badge and to give us your email address for the Guest Designer details (Autumn), for the Top 3 badges (Lula, Jane and Sara) and for the gift certificate details (Lucy). Our current challenge, 'The Sound of Music' runs through Tuesday, May 23rd. We hope to see you entering this time around so that you too can be in with a chance to win. Hi everyone and welcome! Jenny Marples here and it's my turn to share a brand new Friday Focus with you today. This is our opportunity to share with you ideas, tips and techniques for using a specific product or range currently available at The Funkie Junkie Boutique. And even better news, those products then have an extra 15% discount added through May 25th! In the spotlight this time are many of the products in the Seth Apter range. Let's get started. Use the outside ring from the Steering Wheel die set and the outside ring from the Robo Ring dies set to cut three large circles, three inner circles and three connected circles from card as shown. Stack each set together and glue. Cut a piece of 8.5 x 11 inch or A4 stiff board into four pieces. Glue the two separate circles onto one quarter of board and the connected circles piece onto another quarter of board. Stamp one of the circle designs from the Rotators stamp set into the centre of the connected circles shape using archival ink to ensure the line is parallel with the bottom of the board. 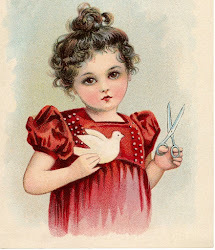 Take pieces of plain calico or muslin large enough to cover the card and wrap around to the other side. Use Glue n Seal or similar to stick the fabric onto the card, adding a layer of glue both under and over to really soak in. Use a rub on tool to push the glue soaked fabric into the die cut areas and wrap the spare fabric around the back of each piece of card. Allow to air dry. Paint the dry shaped fabric with Broken China Distress Paint and blend some Peacock Feathers Distress Paint along the edges of the die cut shapes for definition. Allow the paint to air dry. 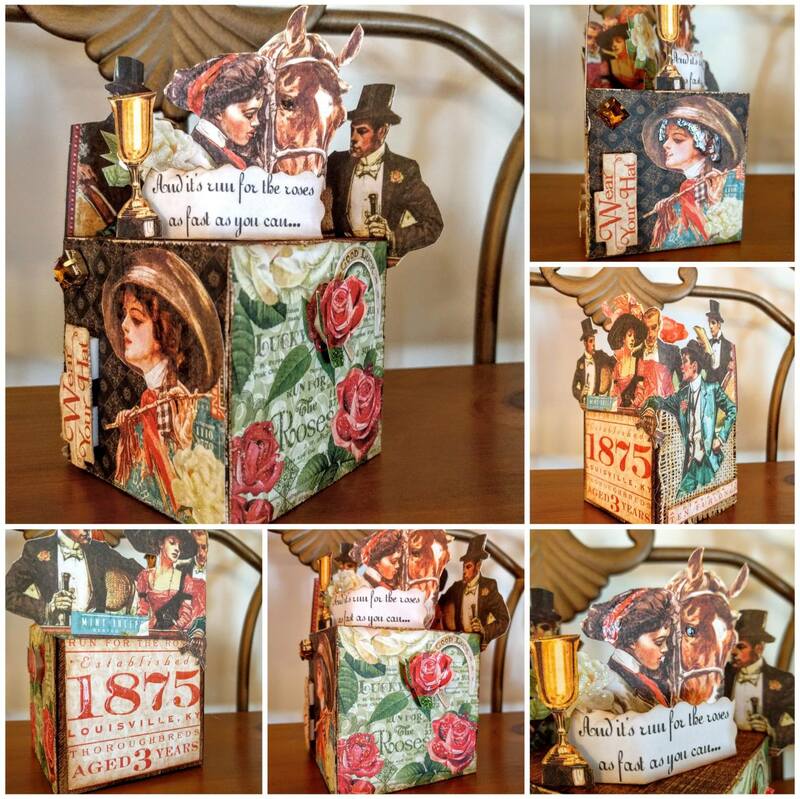 Use a sanding block to rub away some of the paint and create an age worn look. Blend Tree Branch Archival Ink over the raised die cut areas and onto the edges of the cards. 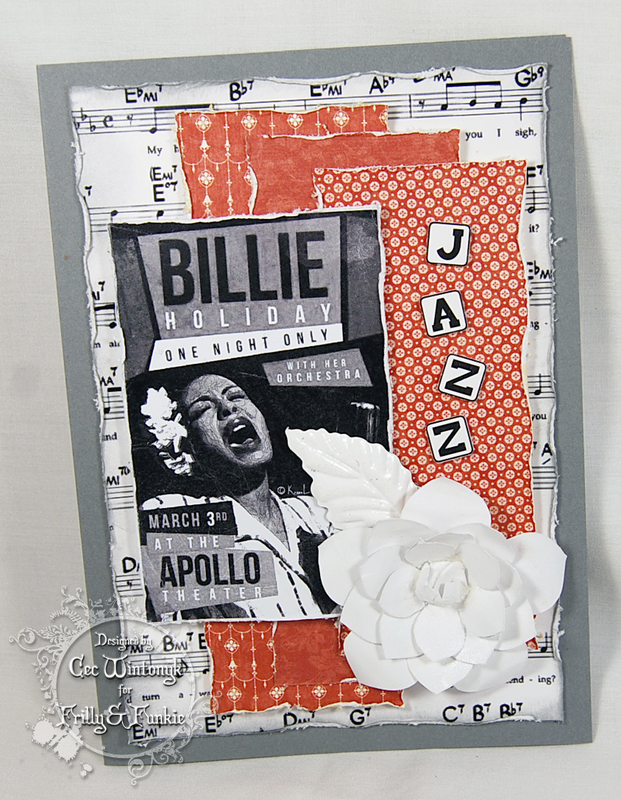 Cover the raised areas with embossing ink and sprinkle with Charred Gold Embossing Powder. Remove excess powder with a brush then heat set it. 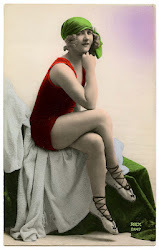 Stamp the same Rotator image onto a piece of card using archival ink. Cut around the image . Cover the card with embossing ink and sprinkle with the Charred Gold Embossing Powder before heat setting it. Repeat four times to build up the depth of embossing. Cover the same Rotator stamp image with archival ink. Heat the embossed surface until molten and press the stamp into it. When cooled remove the stamp. 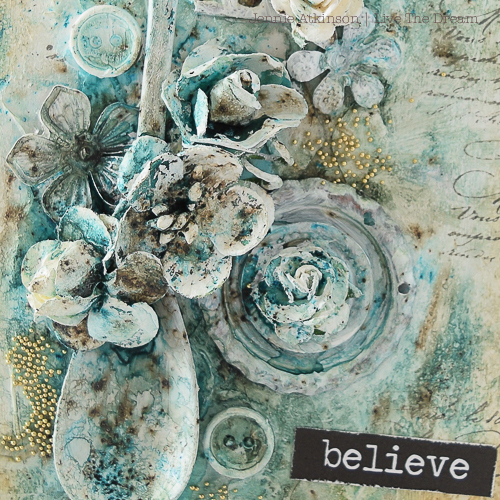 Apply Peacock Feathers, Broken China and Peeled Paint Distress Paint over the stamp and press into the embossed surface to give a verdigris look. Glue the embossed piece on top of the connected circles embossed cover, matching the shape where the initial stamping was. Colour two small pieces of card with Fossilised Amber Distress Paint then stamp in Red Geranium Archival Ink with the French Text stamp. Then in Black Archival Ink stamp two of the quotes from the Tim Holtz 'Life Quotes' stamp set and cut around them, edging with Potting Soil Archival Ink. Glue onto the embossed areas. Bind the book covers to paper signatures using your choice of binding method (I used Coptic Stitching but other methods can also be used). 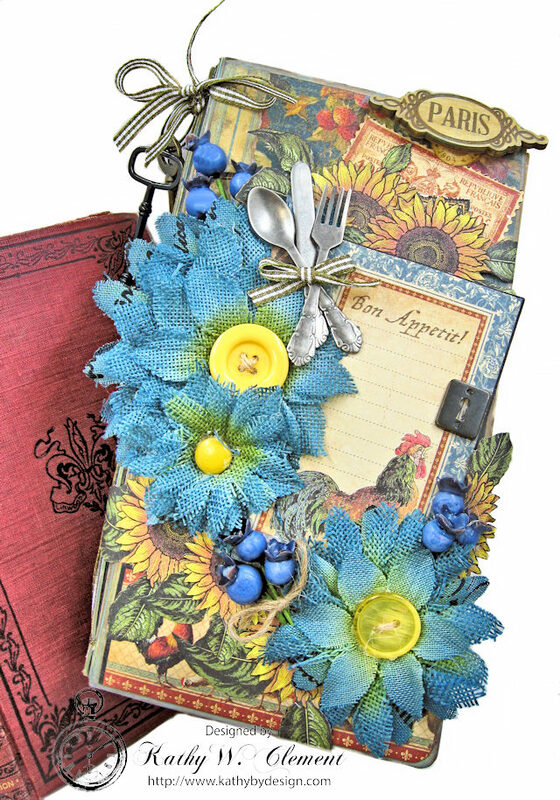 This first book was such fun to make that I went on to create two further notebooks using different textures and embossing powders. For this one I covered the pieces of board with Texture Paste before adding a mix of Broken China, Peacock Feathers, Evergreen Bough and Tumbled Glass Distress Paints over. Rust alcohol ink was then dripped over the surface with water. I used the same method as before to create the central embossed Rotator, this time substituting in the Oil Rubbed Bronze Embossing Powder. That same embossing powder was also added to the large die cut Robo Square around the outside and the stamped dots border, created using the Spotlights stamp set. 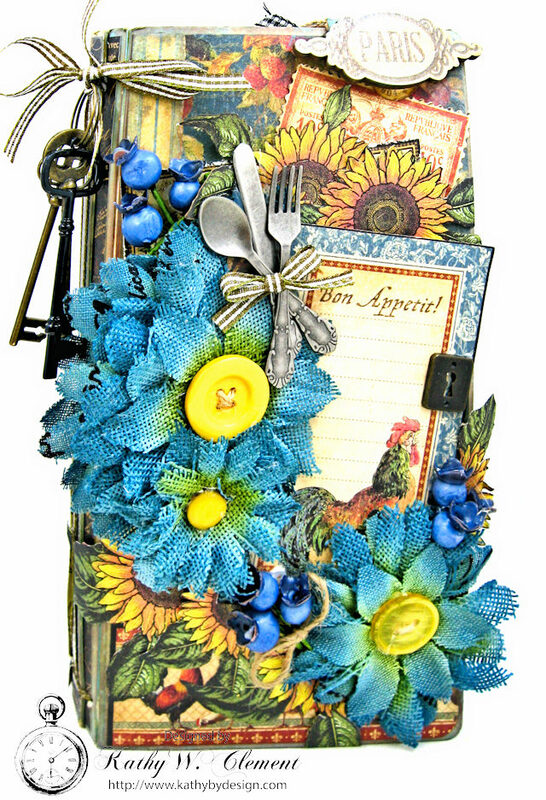 The lettering used card coloured in the same way as the previous notebook. 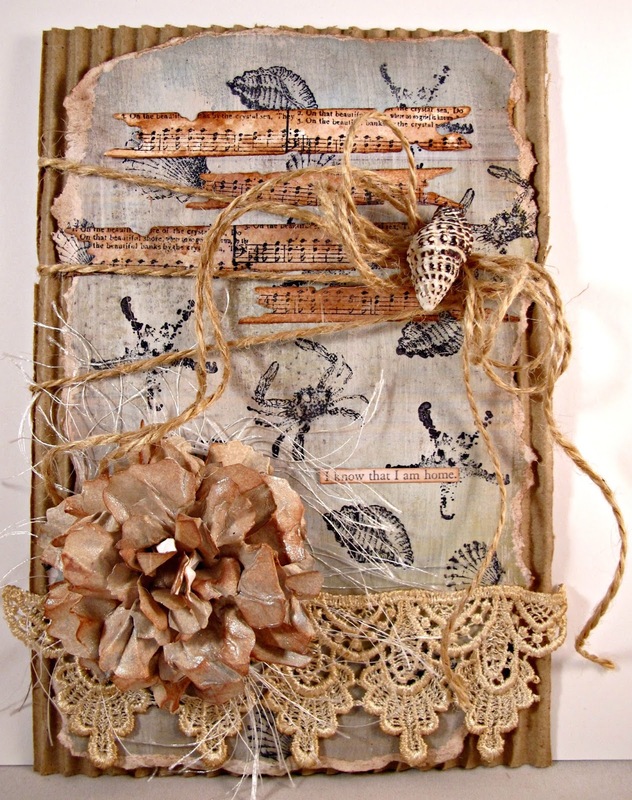 The fabric on the top is a discarded wet wipe though you could create something similar with a mix of Shabby Shutters and Scattered Straw paints/inks. I stamped a couple of different images from the Spotlights stamp set using Cornflower and Red Geranium Archival Inks onto it after trimming to fit the front and back covers. You'll see another of those embossed Rotators, created in the same way as the first one but this time substituting Burnt Copper Leaves Embossing Powder. The self adhesive dots were coloured with a mix of Rust and Pitch Black alcohol inks and Gold Mixative. The words were from the Life Quotes set, this time using a combination of Red Geranium ink on Fossilised Amber paint and Fossilised Amber paint on Broken China paint. 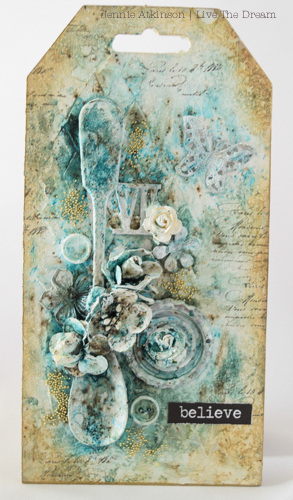 Below the fabric layer, the base board was painted with a mix of Broken China, Tumbled Glass and Vintage Photo Distress Paints before being stamped with the French Text in Potting Soil Archival Ink and more of the Spotlight dots in Cornflower Blue Archival Ink. Well, we covered a lot of different design ideas there didn't we! I hope you've enjoyed today's tutorial. Remember, lots of products in the Seth Apter range have that extra 15% discount added at The Funkie Junkie Boutique through May 25th. And if, like me, you are already hooked it's a great time to stock up on those designs you don't have yet!